The ‘Ghader’ missile is an upgraded version of a previous missile with a 200km reach – prompting fears of marine warfare. 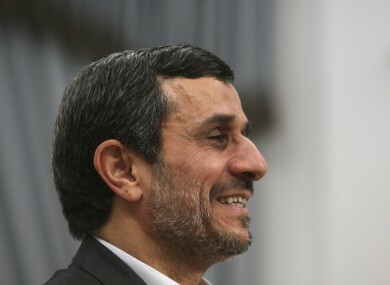 Iranian president Mahmoud Ahmadinejad: the new Iranian missile is an upgrade of an older one with a 200km range. THE IRANIAN NAVY says it has test-fired a surface-to-surface cruise missile during a drill in international waters, its State-run press agency has said. The missile, called Ghader (‘Capable’ in Farsi) was described as an upgraded version of a missile already in service. The navy, IRNA, said the missile “successfully hit its intended target” during the drill. An earlier version of the same cruise missile had a range of 200km and could travel at low altitudes. There were suggestions it could counter the US naval presence in the Persian Gulf. Iran’s navy drill, which could bring its ships into proximity with US Navy vessels that operate in the same area, is Iran’s latest show of strength in the face of mounting international criticism over its nuclear program. The 10-day exercise comes amid conflicting comments from Iranian officials over Tehran’s intentions to close the strategic Strait of Hormuz, and US warnings against such an ominous move. The latest version of the Ghader was delivered in September to the naval division of Iran’s Revolutionary Guard, which is assigned to protect sea borders. At the time, Tehran said the missile is capable of destroying warships. “In comparison with the previous version, the highly advanced Ghader missile system has been upgraded in terms of its radar, satellite communications, precision in target destruction, as well as range and radar-evading mechanism,” a spokesman said. State TV showed footage depicting the launch of a missile, which was fired high into the sky, and said it was capable of hitting targets “hundreds of kilometers away” from the point of origin. The broadcast said two more missiles, with a shorter range, were also tested today. The testing comes just a day after Iran’s navy said it had tested an advanced surface-to-air missile called Mehrab (‘altar’) which was described as medium-range. The sea manoeuvres cover a 2,000-kilometre stretch of water beyond the Strait of Hormuz at the mouth of the Persian Gulf, the passageway for one-sixth of the world’s oil supply, and parts of the Indian Ocean and the Gulf of Aden. A leading Iranian lawmaker said yesterday that the manoeuvres would serve as practice for closing the Strait of Hormuz if the West blocks Iran’s oil sales. Email “Iran holds second test with surface-to-surface missile”. Feedback on “Iran holds second test with surface-to-surface missile”.